The Archives and Special Collections Center recently acquired a small collection of Catholic Right Ephemera. Among these materials is an incomplete run of the rare Irish newspaper Fiat. 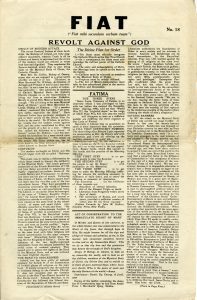 Fiat was the monthly newspaper of the Maria Duce movement, which was a small ultraconservative Catholic group founded in Ireland in 1945. The group’s founder Fr. Denis Fahey was an Irish Catholic priest who was born in the village of Golden, County Tipperary, Ireland in 1883. He entered the novitiate of the Holy Ghost Fathers at the age of 17 and studied in France and Rome before returning to Ireland in 1912, where he was appointed professor of philosophy at the Senior Scholasticate of the Irish Province of the Holy Ghost Fathers at Kimmage, Dublin. Fahey is best known for his writings, which were widely distributed and controversial. He was forcefully opposed to anything he perceived as an attempt to go against God’s divine plan. Fahey was especially critical of naturalism, a philosophical viewpoint that proposes that only natural forces are at work in the world, discounting the spiritual or divine. This put him in conflict with systems that he felt promoted naturalism, including communism, Freemasonry, and Rabbinic Judaism. The Maria Duce movement grew out of a study circle held by Fr. Fahey. There was some secrecy surrounding the group so exact membership numbers are not known, but it is estimated that at its peak it probably did not exceed one hundred members. One of the most notable activities of the Maria Duce organization was its campaign to amend Article 44 of the Irish Constitution of 1937, which recognized the “special position” of the Catholic Church in Ireland, but also recognized Jewish congregations and several Protestant groups. 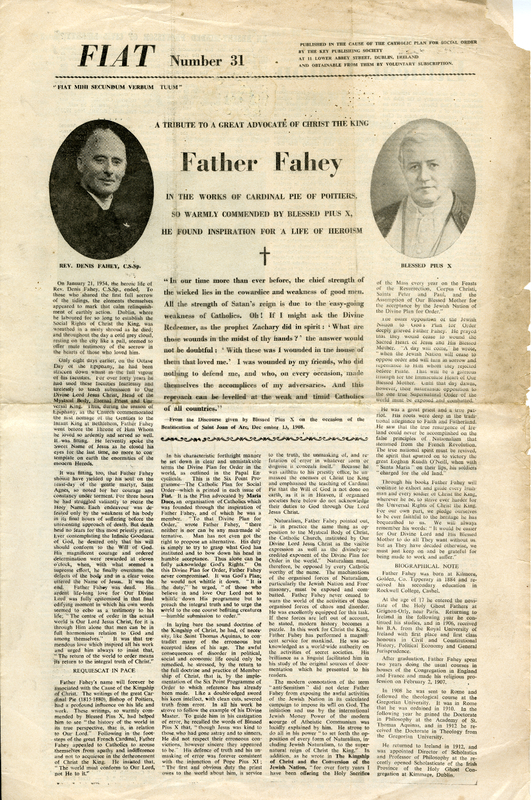 In his writings Fahey called for stronger recognition of the Catholic Church by the Irish Constitution, and objected to the fact that Article 44 placed it on the same level as other religions. 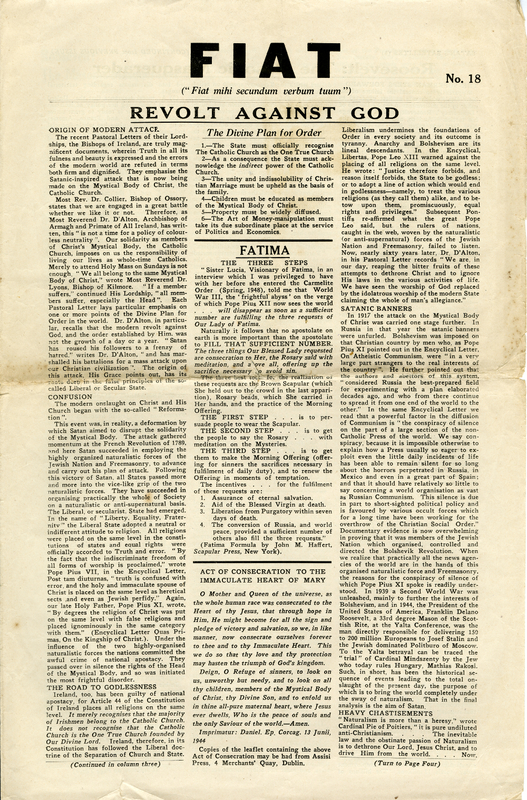 From 1949 to 1951 Maria Duce members circulated petitions calling for the article to be amended to reflect the Catholic Church as the “one true church” of Ireland. However, the campaign was largely unsuccessful because it was not able to secure the backing of Archbishop John Charles McQuaid of Dublin. The movement lost momentum after the failed campaign and Fahey’s death in 1954. In 1955 Archbishop McQuaid ordered the group to change its name as an indication that it did not have official church support. The group continued publishing Fiat into the 1970s under the name Fírinne, and eventually dissolved. 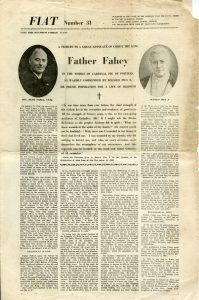 For more information about the Fiat newspapers or the Catholic Right Ephemera collection, visit the Archives or contact us at archives@shu.edu or (973)-761-9476. DELANEY, EDNA. (2011). Anti-Communism in Mid-Twentieth-Century Ireland. The English Historical Review, vol. 126, no. 521, 2011, pp. 878–903. DELANEY, EDNA. (2001). Political Catholicism in Post-war Ireland: The Revd Denis Fahey and Maria Duce, 1945-54. The Journal of Ecclesiastical History, 52(3), 487-511.